A newly produced material is believed to be the "blackest" ever created. Vantablack is a pure carbon coating and absorbs 99.96 percent of incident radiation (solar energy as it hits the material's surface). 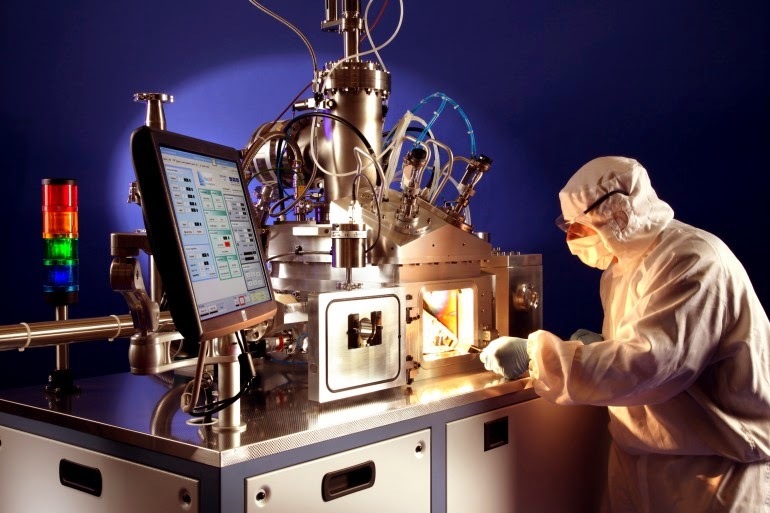 Manufacturer Surrey NanoSystems believes that is the highest such figure ever recorded. Vantablack was created in partnership with the National Physical Laboratory and the ABSL Space Products division of Enersys as part of the UK Technology Strategy Board's Space for Growth program. The program aimed to help space related technologies to reach their full commercial potential. Speaking to Gizmag, Surrey NanoSystems CTO Ben Jensen explained that some work had already been done on creating super-black materials by NASA and other organizations. The materials were being developed in part for use in aircraft and spacecraft. Titanium and silicon substrates were being used on which to grow the materials. Weight is, of course, a major issue where air and space travel is concerned. Additionally, the use of high temperatures when creating carbon nanotube materials means they cannot be directly applied to sensitive electronics or materials with low melting points. As such, Vantablack was developed through a need to use aluminum as a more suitable substrate. Surrey NanoSystems produces Vantablack using a low-temperature carbon nanotube growth process that's usually used when working with silicon. The process utilizes photothermal chemical vapor deposition, with which a solid material is deposited on the substrate from a gas. According to Surrey NanoSystems, Vantablack has the highest thermal conductivity and lowest mass-volume of any material that can be used in high-emissivity applications. Such applications are those that require the use of materials that can better radiate energy. In addition, the material is said to be able to withstand launch shock, staging and long-term vibration, making it suitable for coating internal components. "When you look at a surface it will just look very black," explains Jensen to Gizmag. "When you look at a 3D surface, you can't see any 3D shape. It's just completely black." Jensen believes that Vantablack is a major breakthrough for the application of nanotechnology to optical instrumentation. "Its ultra-low reflectance improves the sensitivity of terrestrial, space and airborne instrumentation," he says. Vantablack is commercially available now and the first shipments are now being delivered.